A digital exhibition, the first in Italy, will be open until March 10th in Milan, at the Fabbrica del Vapore (Steam Factory). 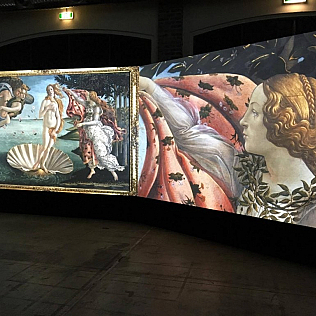 Artworks were not physically transported from the Uffizi to Milan, but here they will be admired through over 1150 digital images with very high resolution, made thanks to the sponsorship of Canon. So visitors will be able to observe them in detail. The subtitle, \"from Giotto to Caravaggio,\" exposes the time period from which date from the more than 1000 works that are part of the exhibition.Caravaggio, Giotto, Leonardo, Botticelli, Raphael, Titian, Michelangelo and others great artists are present. Some of these installations allow visitors to interact with the works, through the touch screen. In short, an emotional experience, that also allow a thorough reading of the works of the Uffizi Gallery. The event is part of the exhibition Back to the Future promoted by the Culture of the Municipality of Milan and is sponsored by the Ministry of Heritage and Culture and Tourism, the Municipality of Milan and the Municipality of Florence.